Wild: Like most Trilobites, Trilobite Conchadurus is an opportunistic carnivore that feeds on anything smaller than itself which it can get a hold of. A sluggish creature, the Trilobite’s best defense is its incredibly hard shell. This seems to be a common adaption for the slower creatures of the island. Domesticated:The Trilobite does not seem to have enough intelligence to be tamed. This doesn’t mean it doesn’t have its uses among resourceful survivors, though. Trilobites are easily one of the best sources of high quality chitin on the island, assuming one doesn’t wish to venture into the dangerous caves. 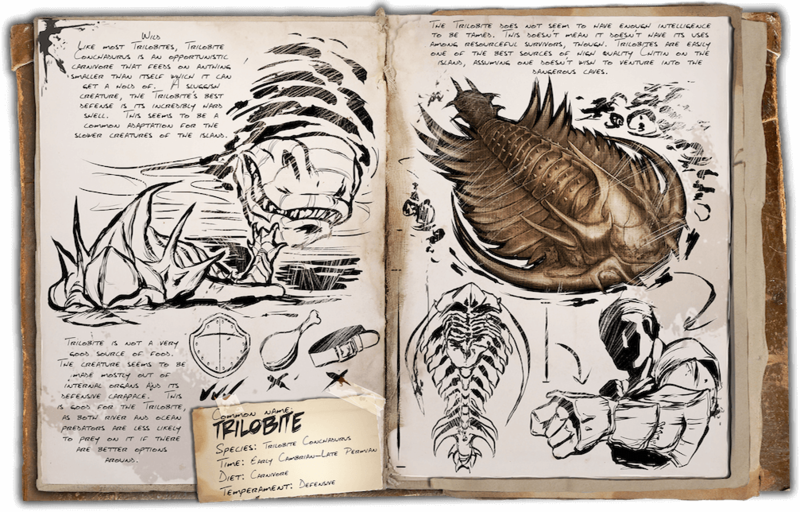 Known Information: Trilobite is not a very good source of food. The creature seems to be made mostly out of internal organs and its defensive Carapace. This is good for the Trilobite, as both river and ocean predators are less likely to prey on it if there are better options around.